Charleston has been a great home for the past 10 days! This city has captivated our hearts with its rich history, poised charm, culinary delights, and hospitable character. With the captain’s eye on the road to recovery, we spent a restful Wednesday getting a lay of the land by way of the dark tinted windowed and air-conditioned vintage-inspired trolley fleet (free). That evening, we made the walk from our home in the Charleston Maritime Center to enjoy a waterfront dinner at Fleet Landing (Iron Skillet Mussels, Carolina Lump Crab Cakes with all the good Lowcountry sides) while watching sailboats race in the harbor. This set our culinary tour through the city in motion. Thanks for the recco, Chip! We quickly realized there was a lot of ground to cover and while downtown is walkable, we decided to rent cruiser bicycles from Affordabike (only $40/bike for the week). 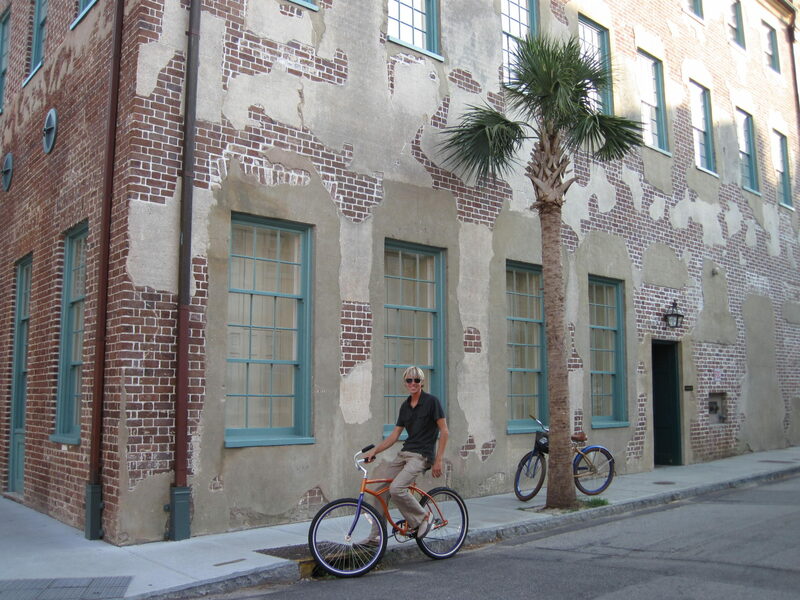 Note: For the discerning visitor who wants to experience true Old Charleston as a guest, not a tourist, Laura offers a comprehensive Charleston Tea Party Private Tour. She will guide up to six people through her friends’ historic homes and gardens in the morning and wraps up with an elegant home-cooked lunch of Low Country cuisine served on 19th century Cantonware at her home. See her website for her number to make your reservation for this authentic Charleston experience when you’re next in town. Stepped back in time as we sauntered through the Aiken-Rhett House (c. 1818), the most intact (preserved, not restored) “townhouse” showcasing urban life in antebellum Charleston. From the original carriages in the carriage house, to the privies (outhouses) in the work yard along its avenue of magnolias, to the warming kitchen and intact slave quarters, you truly get a sense of what life was like for this family and the families that served them. Met our marina neighbors, Steve and Linda Daschew, world famous cruisers of Wind Horse, who now build extremely capable ocean-going cruising powerboats. The Daschews were a gracious couple who gave us a tour of their boat and shares stories of their previous adventures. Meandered through the beautiful Marion Square Farmers Market on Saturday morning where we enjoyed breakfast crepes, chai tea and the abundant sights of fresh locally grown produce, handcrafted art, and the sounds of young native musicians under canopies of sweeping oaks. Rode around the historic Ashley River District and met some great new friends after stopping by their neighborhood lemonade stand. Come to find out they’re a family of sailors that have just as much hospitality as Texans (if not more!). We left with a bike basket full of Confederate Mint to grow on the boat and an invite to joint them for church service and their family dinner for Father’s Day. Wrapped up the evening with dinner and sundowners on the rooftop bar of the Vendue Inn. With spectacular views over the historic homes and out to Charleston Harbor and beyond, it was just one more reason to fall in love with this city. Were treated to a lovely and memorable southern Sunday by joining Laura Wichmann Hipp (a distinguished and warmhearted Charleston native who loves and knows well the city in which she was born) and her family for church service at the remarkable St. Philip’s Episcopal Church (established in 1680) and an elegant Father’s Day lunch at their historic home overlooking the Ashley River. All while learning more about this city’s rich history and their family’s sailing legacy. What a gift they shared with us during our visit! Joined Jessie Marie in the cockpit of Cara Mia for an impromptu dinner complimented by recalling our Bahamas cruising experiences and sharing memories of our dads in honor of Father’s Day. Tuesday morning, we hopped aboard a classic mule-drawn carriage courtesy of Palmetto Carriage Tours that canvassed 25 – 30 blocks of Charleston’s historic downtown district filled with gracious houses, gardens, mansions, churches and parks. The hour-long excursion was educational and entertaining and our carriage driver was both. With full intentions of untying from the docks on Tuesday afternoon (wanted to wait for high tide to depart), we were pedal, pedal, pedaling our way to return our bicycle rentals when we called our favorite Austin cruising family, Honu Lele, to see where they were in the world (they had been in St. Augustine and we were hoping they were near or on their way to Charleston). Turns out, they could make a quick 60 knots (er, mph) by rental car to meet us in Charleston for a couple of days soooo it was settled. We were staying! We toured the town, lunched at Southend Brewery and Smokehouse, and meandered through The Battery, a landmark waterfront promenade famous for its stately antebellum homes, cannons, oak trees, palmettos, statues, a gazebo, and incredible views of Fort Sumter, Castle Pinckney, and the Sullivan Island Lighthouse. From this stroll, it’s easy to imagine the battles that occurred across the harbor. Hosted Honu Lele for dinner aboard Kaleo and then made our way to the Charleston Candy Kitchen for after-dinner treats. Enjoyed our desserts du jour while people watching from the steps of the U.S. Customs House before winding our way through the lively streets to stop by the family-style swings on the pavilion of Charleston’s Waterfront Park. We untied Kaleo’s docklines on Thursday afternoon and headed into Charleston Harbor absolutely smitten with this seaside city. adventure. Looks like tons of fun, enjoy every minute. Hugs! Wow, Charleston does look fantastic! Renting bicycles is a great idea. I love riding bikes, and the midnight ride sounds awesome! Thanks for your notes, Mom and Cheryl! We really fell in love with all-things Charleston. @Mom – We should take a family trip there soon. @Cheryl – The bikes were the best deal in town and that midnight ride was pretty great (albeit rough after the overindulgence ;o).